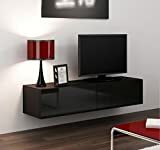 EXCELLENT – HIGH QUALITY – MODERN – UNIQUE STYLE – MATT / HIGH GLOSS – VIGO TV UNIT ! Vigo TV STAND – functional and modern looking, perfect for everyday use. We charge extra (£40-£75) for deliveries to Scotland, Cornwall £60 (TR, PL,TO,EX), Wales £40 (LL,SA,SY). British offshore locations – please contact us for a shipping quote. Two front doors with drop-down opening, high gloss fronts, two compartments inside. Available in various colour combinations also white, black, sonoma oak. We charge extra (£40-£75) for deliveries to Scotland, Cornwall £60 (TR, PL,TO,EX), Wales £40 (LL,SA,SY). BMF furniture come flat packed and require home assembly – if you are NOT experienced with flat packed furniture assembly, we strongly advise to read TIPS, HELP&ADVICE materials available online before putting your unit together. Alternatively please look for local assembly service companies. Returns accepted only unused/undamaged and in original packaging – as per our Terms&Conditions. If assembled, the return may not be accepted. Returns are subject to BMF inspection / restocking fee.